The Functional / Shortcut keys are available in the Finacle software which is developed by Infosys. 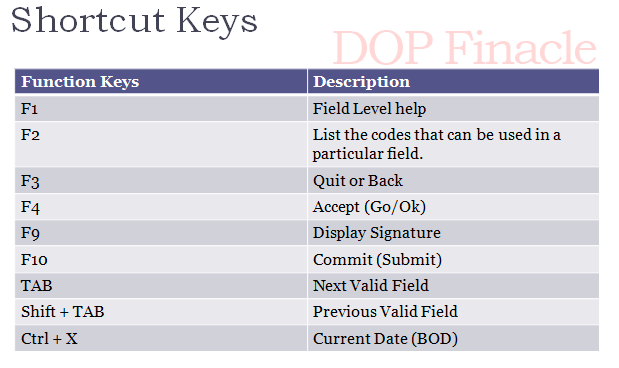 But the modified version of Finacle in DOP is limited to access the shortcut keys. In Date Field while Press the Ctrl + X to Enter the BOD/Current date. This option may not work in some of the fields which is not configured with above shortcut. This entry was posted on August 09, 2015 and is filed under Finacle , General . You can follow any responses to this entry through the RSS 2.0 feed. You can leave a response, or trackback from your own site.